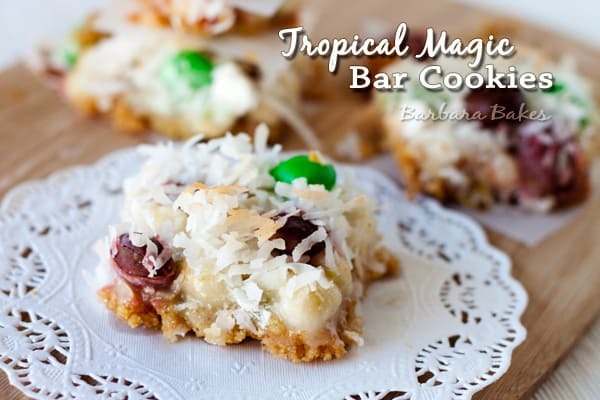 An easy to put together bar cookie with a tropical twist. A graham cracker crumb crust topped with layers of white chocolate chips, Coconut M&M’s, macadamia nuts, shredded coconut, and a sweet gooey lime filling. Magic Cookie Bars, 7 Layer Bars, Hello Dolly Bars what ever you like to call them, are a very popular bar cookie. You can even find the recipe on the back of sweetened condensed milk cans and boxes of graham cracker crumbs. 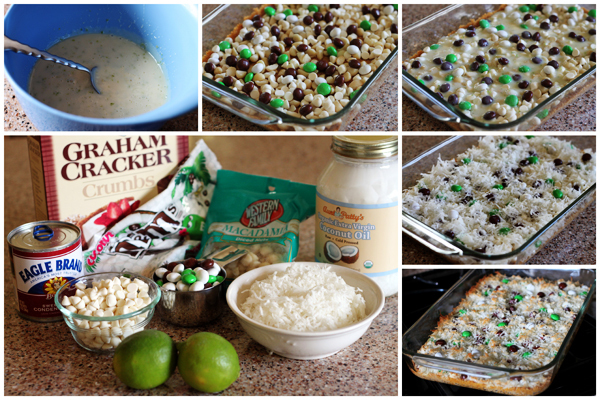 I decided to change up this sinfully rich, ooey, gooey treat and give it a tropical flare with a little lime zest, macadamia nuts and Coconut M&Ms. I added the zest of two limes to the sweetened condensed milk and the lime flavor is a perfect match for the chocolate, nuts and coconut. I made the bars with coconut oil, but the crust didn’t set up as firmly as if I’d used butter, so I put butter in the recipe below. If you love citrus desserts and magic bars, you’re going to love this version. In a large bowl combine graham cracker crumbs and sugar. Add butter and toss until combined. Press into the bottom of a 9 x 13 baking pan coated with cooking spray. Bake until firm, approximately 10 minutes. Cool on a wire rack for approximately 20 minutes. In a small bowl, combine sweetened condensed milk and lime zest. Set aside. When crust is cooled, top with macadamia nuts, white chocolate chips and M&Ms. Pour condensed milk over the top, spreading to cover completely. Sprinkle coconut evenly on top of condensed milk. Bake until coconut is toasted, 10 to 15 minutes. Transfer to rack to cool completely before cutting. Today’s post is week 6 of my 12 Weeks of Christmas Treats hosted by Brenda, Meal Planning Magic. Be sure and check out all of the fabulous treats the other 12 weeks of Christmas Treats bakers baked up for this week. Pingback: Graham Cookie Bars from Never Enough thyme — Never Enough Thyme - Recipes with a slight southern accent. Oh my word, these bars look wonderful!! I haven’t had one of these since I left the states. No graham crackers here but I’ve learned of a make-do so I’ll give these a try. They look perfectly tropical. It’s summer here so very fitting indeed. Love the coconut M&M’s, this has got to be delicious. These look really yummy! I love coconut! Have a great Sunday! i want one! these are wonderful, i love the tropical spin! The bars look so pretty. Nice addition for a Christmas cookie platter. These sound fantastic, Barbara! I didn’t even knew they made coconut M&Ms and how I love coconut! Love how you used coconut oil!! What a awesome cookie!